BusinessBloggingBootCamp: Blyopia (Part I): Is it contagious? Blyopia (Part I): Is it contagious? We may have a new pandemic to worry about: Blyopia. Bly-opia: n. (comb. from Bly, as in Robert Bly, and myopia) 1. mental tunnel-vision thought to be caused by an idea virus that blocks the ability to see any value that cannot be both immediately measured and traced directly to one's own activity. 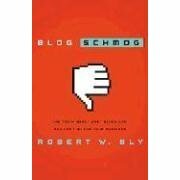 Okay, it's not really Bob's fault alone, but we've been reading his upcoming book, Blog Schmog: The Truth About What Blogs Can and Can't Do for Your Business, and his name fits together so well with my opinion of what's wrong with his thesis that I couldn't resist. So, apologies, Bob. As you might guess from the main title and the icon on the cover, Bob has a lot of negative and precious little positive to say about blogs. The root of his problem is his inability to compare business blogging with anything other than his own field of writing copy for direct marketing campaigns. Hence Blyopia as the name for his disease. And the disease appears to be spreading. of Coke am I selling? Quoted by Wendy Davis at Just an Online Minute (subscription required), Max Kalehoff at Engagement by Engagement, and Donna Bogatin at ZDNet's Digital Micro-Markets, among others. So Blyopia apparently infects those attempting to employ other social media in their businesses, not just blogs. Bob's thesis in his book is, basically, that a direct marketing campaign is better than a blog, because he can measure the results of his campaign and tell John "how many more cases of Coke" he sold. What Bob and John are missing in that comparison is that it tries to equate the blog with the marketing pieces Bob creates. It tries to draw a straight line from the blog or the piece to a sale. But social networks hyperlinked with social media (blogs, video sharing, etc.) are more than straight lines. They are intricate, extended linkages. From a marketing perspective, a social media message may result few or no sales to the first recipients and efforts to "measure" the ROI immediately may be disappointing. But that same message remains in the network and over time can grow legs, accumulate supporting messages (generated by consumers, not the marketer), and yes, generate sales later that simply cannot be traced in a straight line from Bob or John's message to the case of Coke. Ego-deflating for the marketer? Perhaps. Good for the business? What do you think? Blyopia (Part II) will explore what makes marketers susceptible to its narrow fixation on measurement and more about the pervasive business benefits of social media and "engagement." Blyopia (Part III) will consider ways to immunize yourself and your business from Blyopia (cures are reportedly rare). Robert Bly is my "hero" so I began reading this cautiously until I realized you were talking about the "other" Robert Bly. Not the noted American poet - Robert Bly. Could you change your tag so it includes the Other's middle initial, Robert W Bly? British scientist Lord Kelvin said: "When you can measure something in numbers, you know something about it." Direct marketers almost always know their marketing ROI. Bloggers usually don't. Thanks for weighing in. I hope you've already forgiven the terminology and are joining in the playful spirit of the debate. Now, with all due respect to Lord Kelvin, I doubt even he would cling too tightly to the quote you offer, since he lived into the era of Einstein's "thought experiments." The quote gets at the root of the problem, though, because you seem to want to treat it's converse as true: that if we can't measure something in numbers we don't know anything about it. Or worse, if we don't yet know how to measure something, we should act as if it does not exist. That, my friend, is utter nonsense. Scientists from Gallileo to Einstein to Hawking have gone about creating hypotheses and tests, eventually leading to theories and even laws, about things they first felt and then "knew" must exist, years before they could measure them. Should we try to figure out ways to identify and measure the many positive impacts of blogging and social media? Should we wait until after someone solves the measurment problem before we use these new communication tools?